This is an article about an image. A screencapture at that. It’s not that amazing (false modesty, it’s amazing) because I’ve been practicing my SEO skills here on Thoughtcrimes in preparation of promoting the Stand Up To Stigma site. What has been my goal? First, I needed to create proper parameters for my photos of Clare. Not Clarissa Nina Castellano, the Google search term. 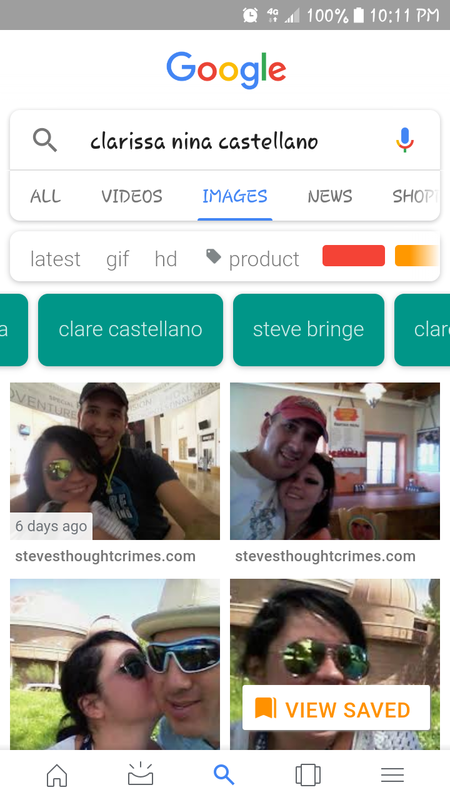 I needed an image tag to read “Clare Castellano.” Then, I needed “Steve Bringe” as an image tag immediately following. Then, I needed the primary images to be those I’ve SEO’d of the two of us. Success, and now a skill I can employ for SUTS. For you, Hua Hua. This new skill will be used to destroy . . . Stigmas.